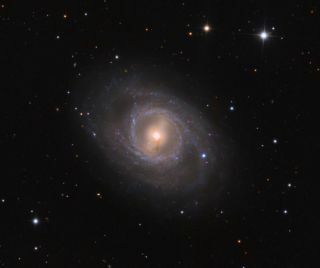 Galaxy M95's latest supernova, SN 2012aw, was discovered on March 16, 2012. Astronomers have identified the star that may be responsible for a supernova discovered by skywatchers last week, SPACE.com has learned. The supernova popped up in the galaxy M95 about 33 million light-years from Earth. It was first reported last week by a several different observers and soon confirmed by major observatories. Now a team led by Nancy Elias-Rosa of Spain's Institute of Space Studies of Catalonia has compared new photos of the exploded star with pictures taken before the supernova occurred to identify what could very well have been the culprit star. "By lining up the stars that surround the supernova in the new picture and the old picture, you can then see what, if anything, was at the position of the supernova in the old Hubble picture," said University of California, Berkeley astronomer Alex Filippenko, a member of Elias-Rosa's team. "What we found is a star that looks like it's a red supergiant." The unnamed suspect was a massive star in the late stages of evolution. It is these types of stars that are thought to run out of fuel for the nuclear fusion that powers their cores, then collapse in on themselves to become black holes or neutron stars, releasing huge amounts of energy in luminous explosions seen around the universe. "It's precisely the type of star you expect," Filippenko told SPACE.com. Follow-up spectroscopic measurements, which break up light into its constituent wavelengths, show that the supernova contains hydrogen, classifying it as a Type II supernova, one thought to be born from the death throes of such massive stars. Still, the images aren't precise enough to confirm that this star was the source of the blast. The team has plans to observe the spot again early next week using the adaptive optics system on the Keck telescope on Mauna Kea. This high-resolution tool produces extremely crisp pictures by compensating for the atmospheric turbulence that causes images to blur. "With that we will be able to more precisely locate exactly where the supernova is and compare that more-accurate position to see if the star we identified is exactly coincident with the supernova," Filippenko said. Supernovas are relatively rare events in the universe and they fade away quickly, so astronomers have to be especially speedy to spot them in time. Furthermore, many are too distant and faint for astronomers to identify the stars that set them off. "There's been very few supernovae whose progenitor stars have been identified, so we still are trying to understand what kinds of stars can explode and how do they explode," Filippenko said. And ironically, though this dynamic event appears to be happening now before our eyes, everything actually went down 33 million years ago, which is how long it took the supernova's light to reach Earth. In reality, the star that caused the blast has been dead for millions of years, though people on Earth were able to see it shining brightly until last week.